First, we arrive at Project 20. 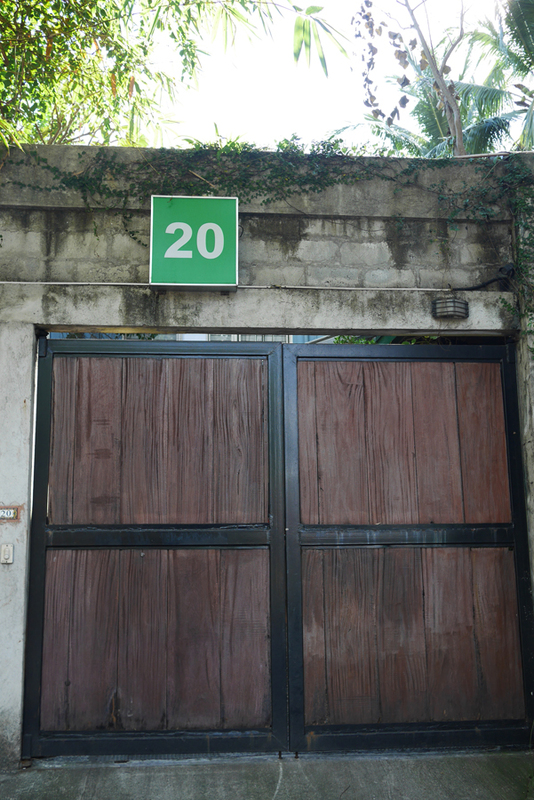 The reason why it is called Project 20 is that the space is located at 20 Maginhawa street in the Quezon City. 98B is also named after its address. It’s simple and easy to understand. Passing through the gorgeous doorway, we find a trendy space inside. First I hear about the space from Gail Cicente, who is the project manager of the space as well as being an artist. 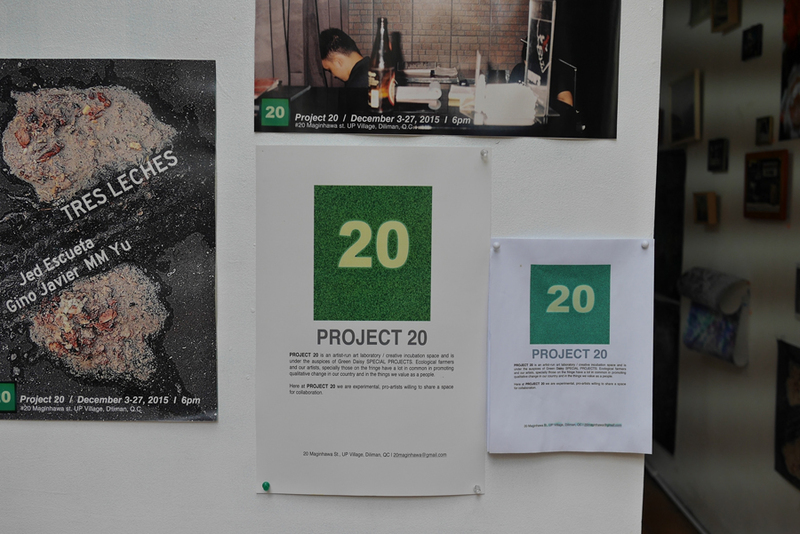 Project 20 is a new art space, which started in November, 2014 with a gallery, organic restaurant and organic food shop. 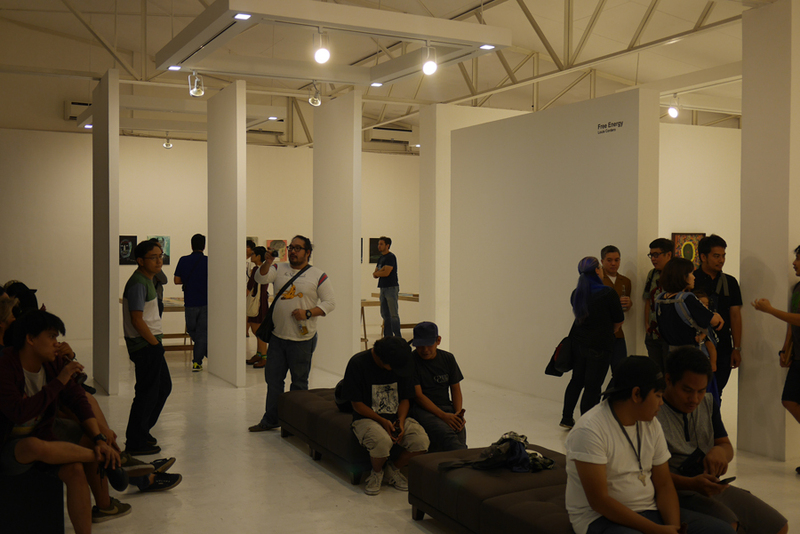 In addition to contemporary art, they sometimes conduct live music concerts, talk events, and workshops. 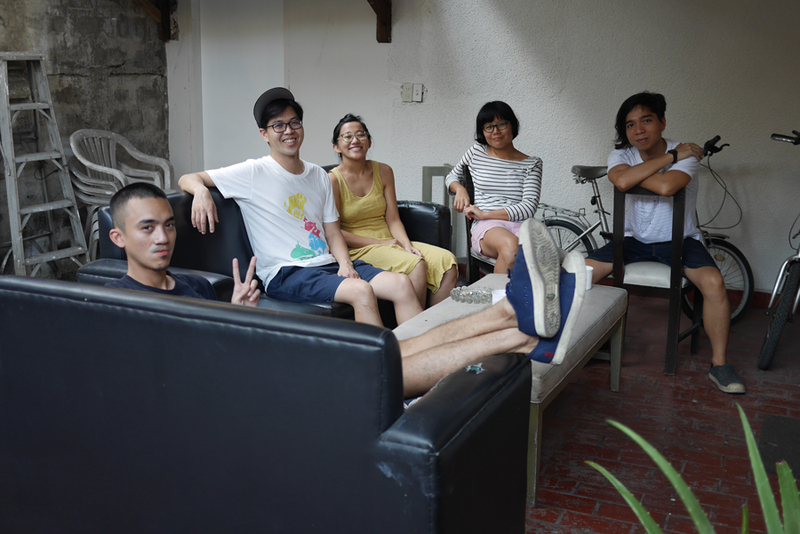 One feature which stands them out from other artist-run spaces is that they have a deep connection with a farm located in the northern part of Manila. 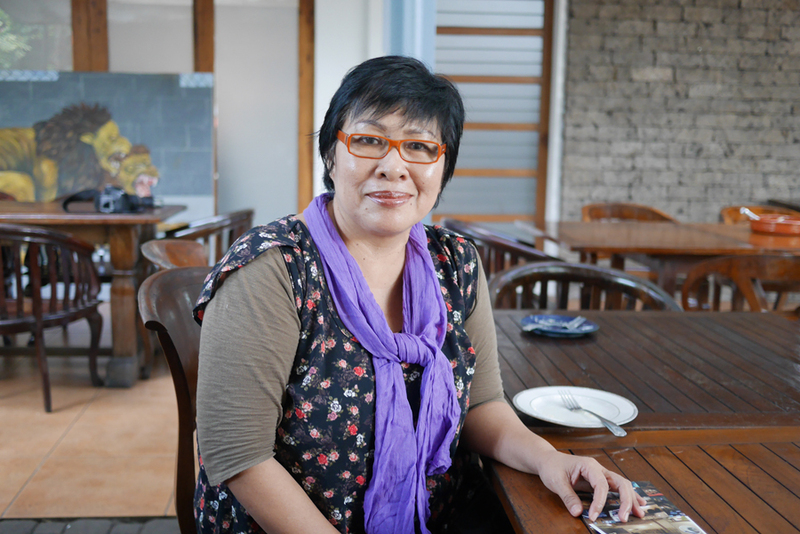 Daisy Langenegger, the founder of the art space also focuses on managing and growing organic vegetables on the farm. So the space has both an organic restaurant and shop. 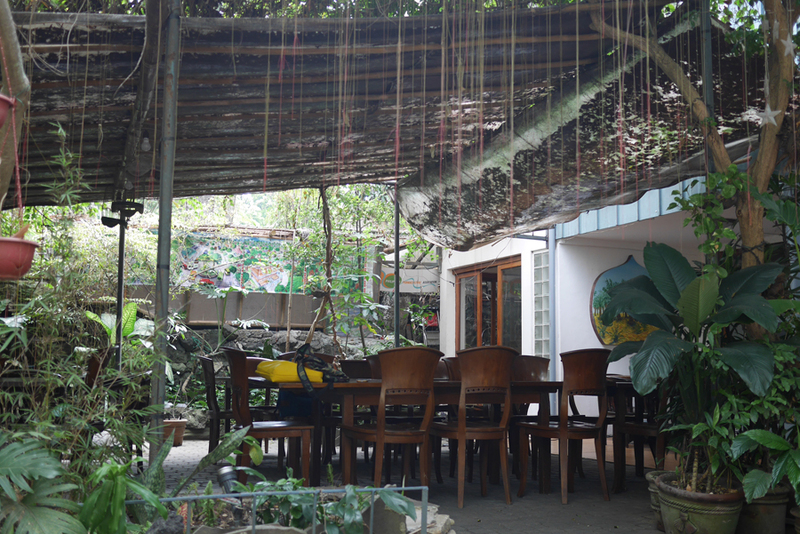 On the farm, there is also a residence where artists in Manila can stay for fixed periods of time creating their artworks, and also helping out on the farm. What an original combination – farming and art. I’m sure this could work well in Japan as well, don’t you think? 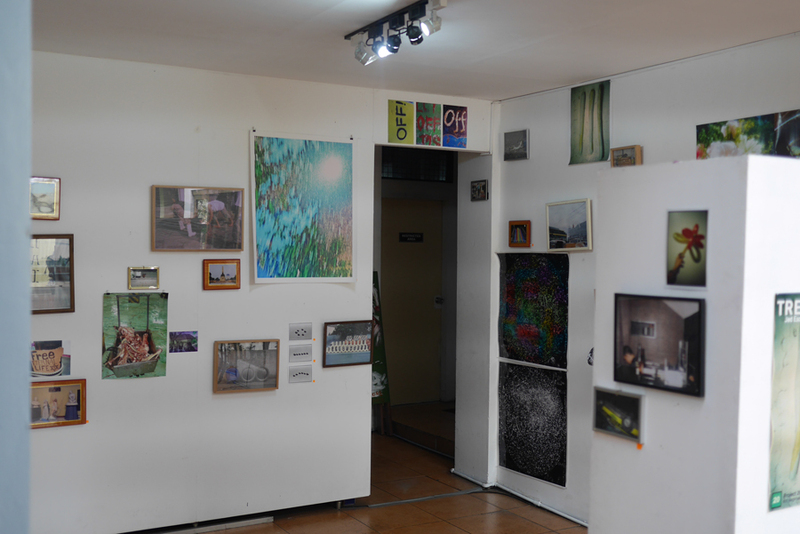 In the gallery, there is an exhibition of photos. 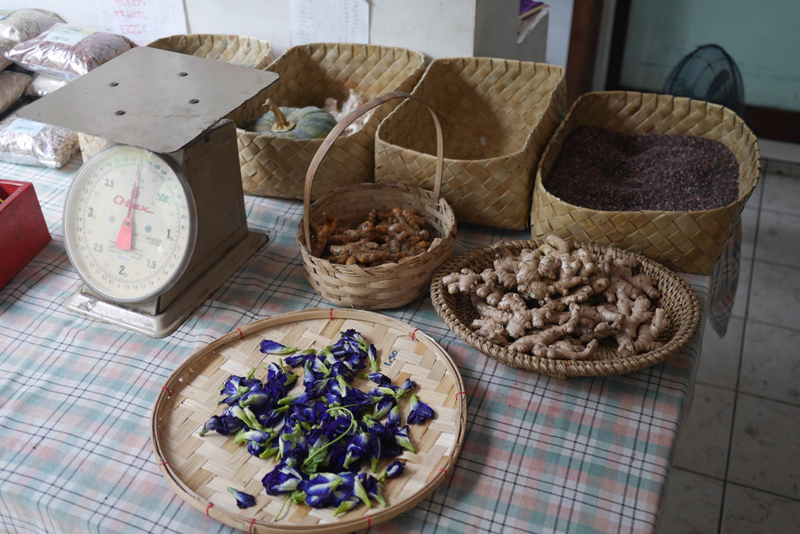 There are many kinds of organic foods, it’s so cool. Daisy Langenegger, is the godmother-like presence of Project 20. She has had a long-term relationship with the Japan Foundation, giving young artists opportunities and providing a place where they can develop into professional artists. Saying that “Farmers can also understand and encourage art,” there is something really gorgeous about her. I wonder if you can make a lot of money farming in the Philippines? But, anyway she seems to just really love art and artists. She is like nice mother to everyone. Today three young photographers were having an exhibition and Daisy went around to speak with each of them about the concepts of their work. Apparently she does this for every exhibition, you can really feel that she wants to cultivate young artists. Daisy has a son who is a painter. He doesn’t resemble his mother at all. Acting really cool, he always has a beer bottle in his hand and his artworks are also filled with danger. I love the contrast between mother and son. It may have been a little disappointing if he had grown up as a typical eat-your-organic-veggies kind of kid. But because of the contrast I am struck by the power of art. This is Daisy’s son’s painting. 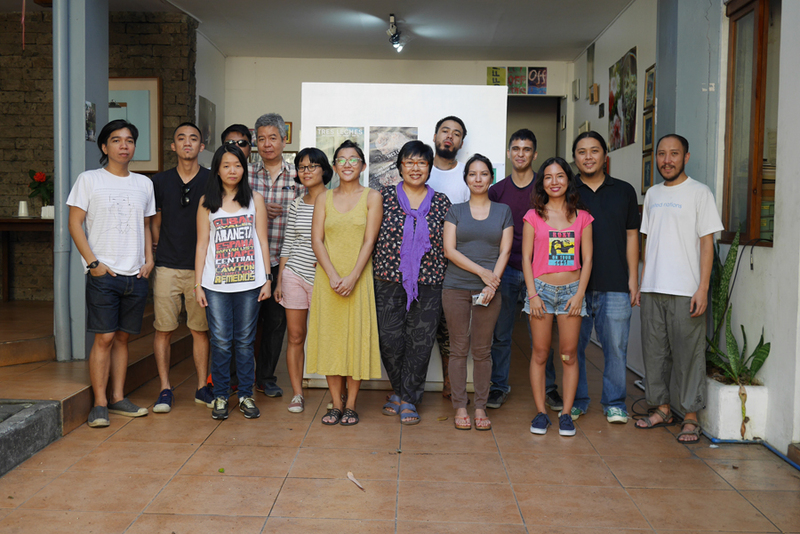 Lastly, I take a picture with everyone who came to the exhibition, and all the artists. According to Daisy: “Everyone is Project 20 family”. Behind Daisy is her son, glaring at the camera. 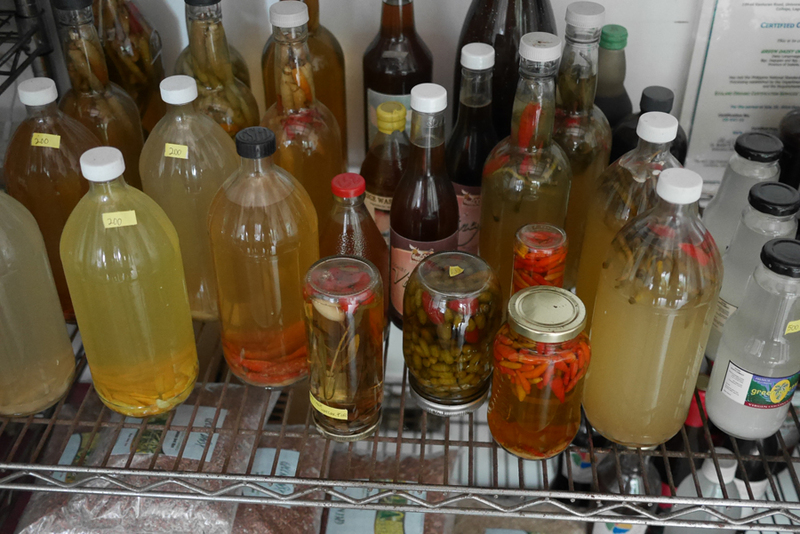 If you are interested in “farming” and “art” you should definitely visit Project20. 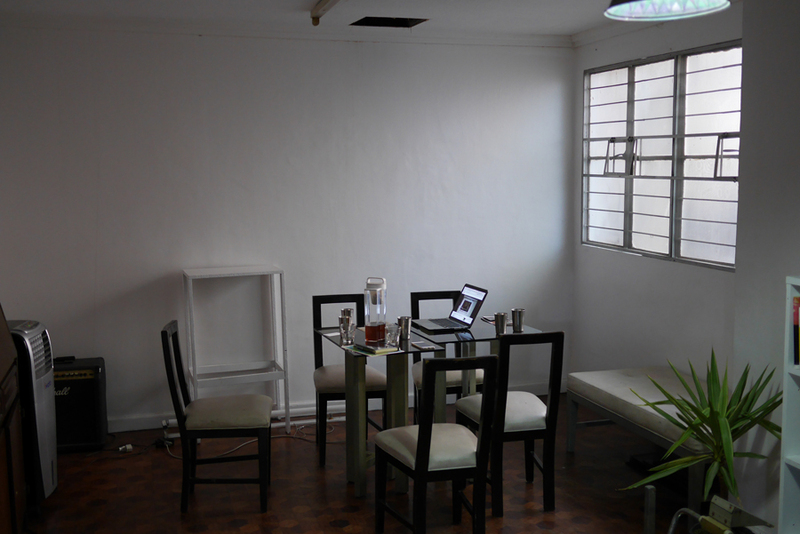 After saying goodbye to our God Mother at Project 20, we move to a nearby space recommended by Gerome. The couple who visited Project 20, weren’t actually God Mother’s family but members of Los Otros, an art space which mainly deals with experimental movies. 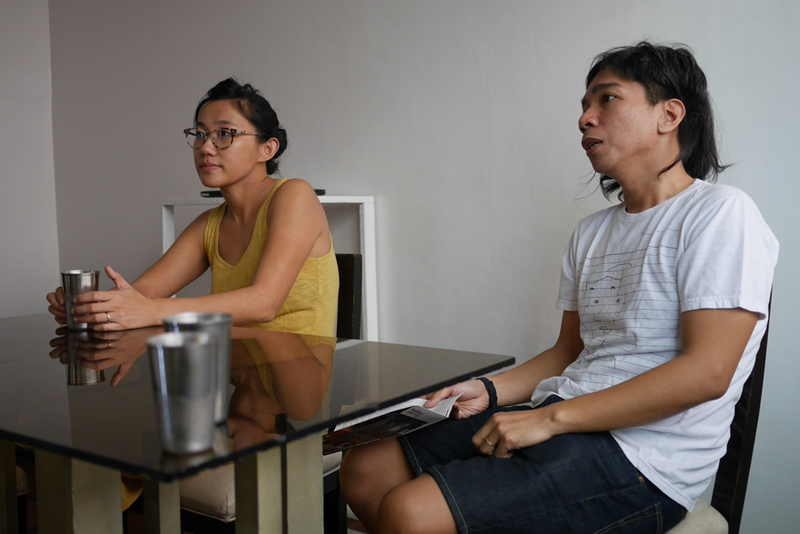 Shireen Seno and John Torres established the space in their house. They sometimes hold experimental movie screenings, talk shows, and workshops. 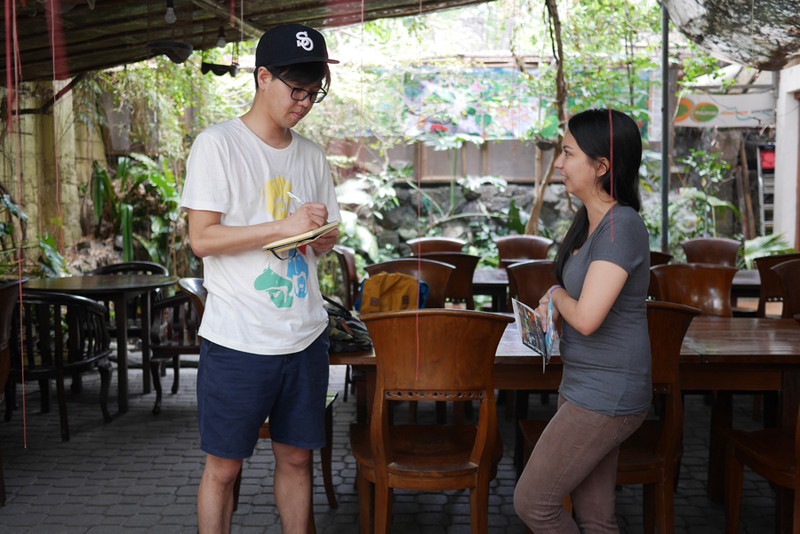 There is also an artist residence and at the time Zi Yun Lam, a filmmaker from Melbourne was staying on the second floor. Shireen Seno （left） and John Torres （right） . Projectors can be used not only indoors but outdoors as well. 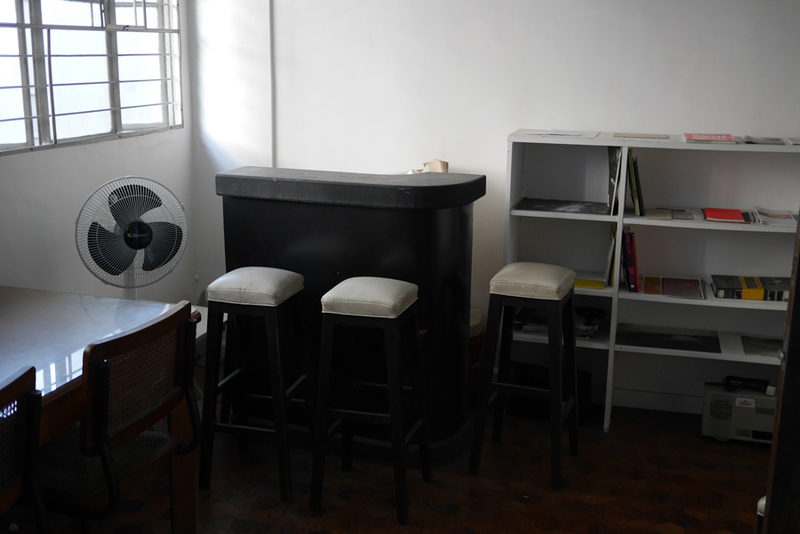 During screenings, the bar can also be opened. It sounds so fun! The living room transforms into a space for screening movies. This is the bar counter. When I ask them how they manage to run the space, they answer that they succeeded to get a large subsidy from a foreign foundation. I’m jealous. They have connections with organizations and experimental filmmakers in Japan and we have some mutual friends. When they ask me if I know any good Japanese filmmakers I introduce Hikaru Suzuki. I show his work on Youtube, but there are no subtitles in English so it’s difficult for them to understand. Japanese artists including Hikaru should always put English subtitles! Lastly, we take a picture in the garden. The woman wearing stripes is the resident artist Zi Yun Lam and the man in front of me is also a member of Los Otros, but I forgot to ask his name, SORRY. When you want to see experimental movies you should go to Los Otros! 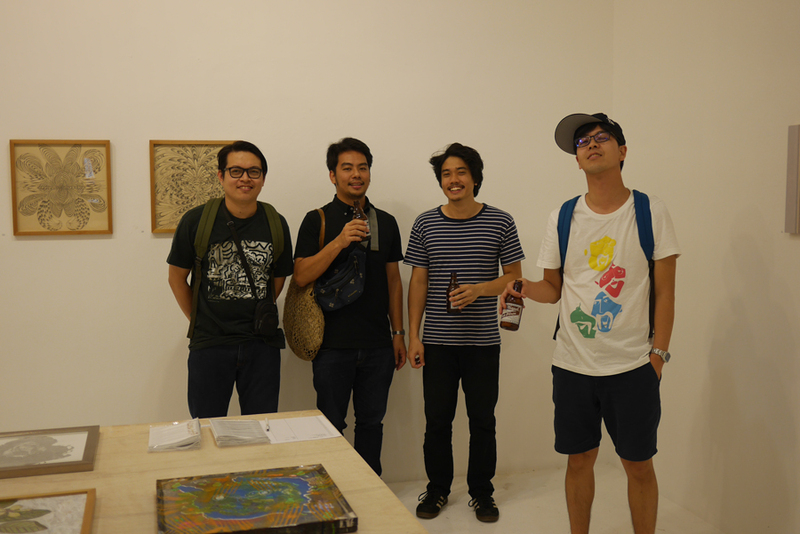 The next destination is a gallery named DRAWING ROOM which is a part of the commercial art scene in Manila. I find the Japanese artist Yugo Isaji. He is good with his hands and his face looks almost Filipino. At the gallery, there are a lot of rich people. Isaji, it’s good that you can sell your art works. I also find Lindsey Lee who joined our residency program in Tokyo, Ongoing AIR in 2014. He came to the gallery to meet me as he heard that I was in Manila. We all take a picture together. 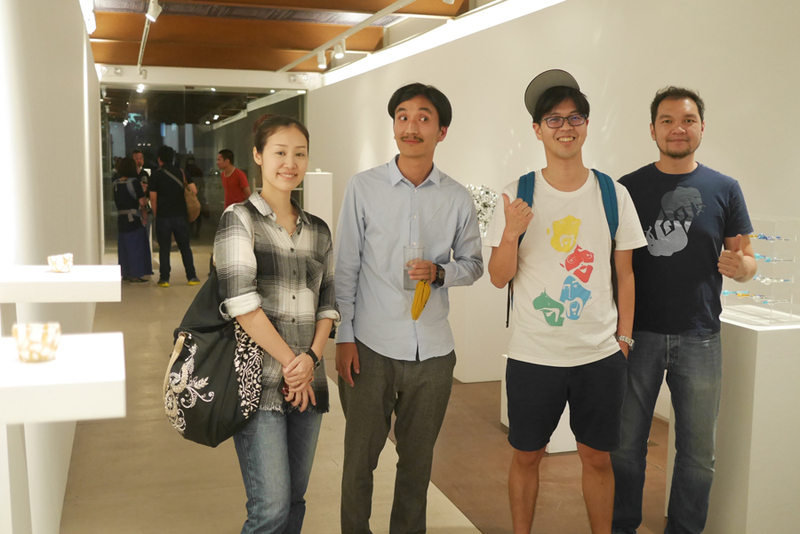 The woman on the left is a Japanese artist who lives in Manila named Atsuko Yamagata. Next, we move to another commercial gallery’s opening party. I forgot the name of the space, but I remember there were a lot of young artists there. In Japan, there is a similar commercial gallery district known as Kiyosumi Shirakawa （I’m not sure if it still is, but it used to be, for sure）. 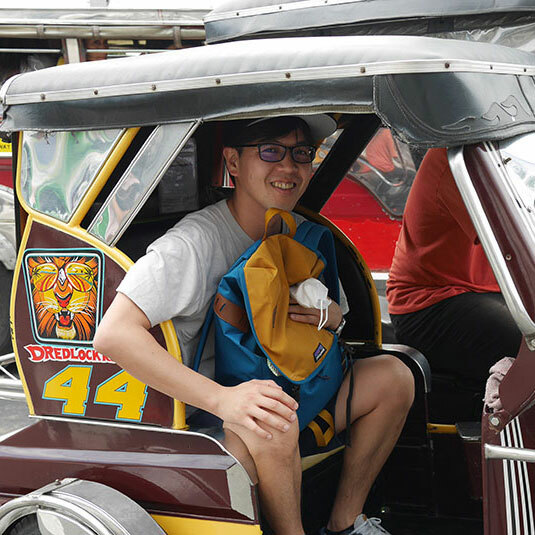 Also in Manila, there are a lot of commercial galleries and young full time artists （artists who can make their livings from the sales of their artworks alone）. I realized that it was a very different situation to the artists in Japan. But anyway, I don’t really feel comfortable in this commercial atmosphere. Tired, I go back home. 20 Maginhawa St., UP Village, Diliman, Q.C. 59 Mahabagin St, Teacher’s village East, Q.C.